NewView ist ein Programm zum Lesen von OS/2- (oder eComStation-) Hilfedateien. 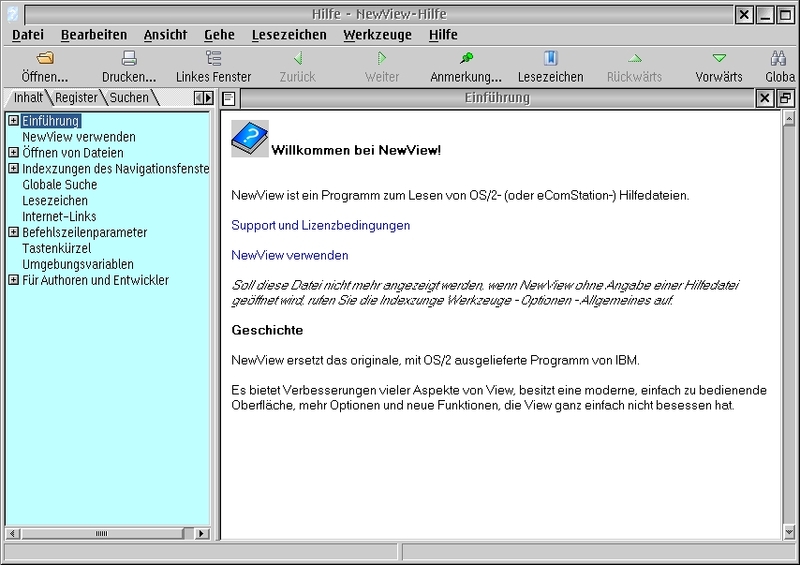 NewView ersetzt das originale, mit OS/2 ausgelieferte Programm von IBM. Es bietet Verbesserungen vieler Aspekte von View, besitzt eine moderne, einfach zu bedienende Oberfläche, mehr Optionen und neue Funktionen, die View ganz einfach nicht besessen hat. - Fix: Wrapping, navigating and selecting of DBCS and Thai text should now (more or less) work. - Fix: Text copied to the clipboard should no longer have garbage appended. - Fix: NewView is now able to open really large help files (e.g. jdk14corba.inf with 11921536bytes). - Fix: In some situations the highlighting of the search results marks to many places in a topic. - Support for 'Internet-Application-Integration' added. NewView is now able to start different applications for news, mail and ftp. - Fix: More link fixes. - Fix: Links in the about dialog are working as expected. - Fix: Searching all drives works again. - Fix: Broken link handling; NewView was unable to start a program or open the web browser. - Fix: Detection of links pointing to a url was not working. - the default of the option 'Show left panel for - Online help for applications' is changed to true. The command line syntax is changed. newview /s cmdref "net access"
- Fixed font substitution now works. This overcomes a limitation of the IPF format. and other common help files. - Window is restored if app help is requested while it's minimized. - Fixed invisible startup window if a minimised help window already exists! - Corrected some translation/hint problems. - Fix for problems when network printers configured. - Fixed problems with own help file. - Phrase search e.g. "warp server"
- New /s option to do a normal search. - Help improved; includes context help for some things. - Other tweaks to disable menu items, etc. if . is in path. - Use Web Explorer for browser, if no other registered! in the system help dir. Old newview.inf is deleted. - Own help file can now be language-specific, as for interface. - Also look in %OSDIR%\lang and %ULSPATH% for language files. using .lng files (e.g. AE). filenames are too long for FAT). On topic area, Drop+Shift sets fixed font. - Options form more compact. NOTE: Full manual install now REQUIRES many more steps. See readme.txt! into URLs and use the default browser. open and uses them instead of opening new windows. when a custom font is used (pmprintf.hlp). unless you have customised them yourself, before installing. new files will be ignored in favour of the old ones. - Fixed crash on "Using Help"
since most of them are not region-specific. - Allow translation of NoteForm and other misc. - Fix text on crash dialog buttons! - Note buttons now standard. Buttons larger. - Fix crash if no file specified for "Open Special"
See the Readme. Anyone can create translations! - Silently ignore if ini file unwritable. Open Class Library programs (Thanks PeterN). - Check for corrupt desktop at install. - First time window is centered. - Fixed crash clicking in index! - Fix crash after Save As (and other?) dialog! Faster, better layout, more options, and many bug fixes. e.g. PMREF function topics, left pane. - Page up/down works when cursor showing! - Improved fixed font selection. - Fixed: text background fixed at white. - Added filename completion to the file dialog. - SHow file titles in the file dialog. - Getting ready for online help mode. - Removed unimplemented History item. Parent is never changed after window created. Don't crash. to verify exact sequences in the help file. - Added a popup menu item to search for the selected text. - Adding logging of call stack on exceptions. Hurrah! - Allow run-in images to be aligned (centred etc). - Put spaces after images if spacing is set (guess). - Set window size before display to avoid flicker. - Fixed some minor issues in help file. - Added support for links by resource ID. - Added option to turn toolbar images off. - Fixed all windows invisible! windows can be sized and closed. - Reconnected color wheel and value bar in options. Whoops. "Help" - "How to Use NewView"
Also option to Expand All on file open. in the same directory as the help file. - Layout the crash dialog text a little better! - Added popup menu for topics. - Fixed up a couple of crashes in global search. - Various minor cosmetic fixes. - Changed to put INI file in application dir. - Major revamp of search. enough to handle e.g cmdref examples links. are defined. Give a warning if not. - Put INI file in application dir. - Wrapping works properly with outline fonts. - Text centering via $fb code works. - Checked the contents loading more carefully. - Implemented bitmap flags, except for stretch to fit. - Loading rewritten. Twice as fast. - Fixed big mess I made a big mess of bitmap loading. - Fixed file dialog some more: now changes directory when typed in. - When images cannot be loaded, just displays a 'missing' placeholder. - Menu hints, displayed in status bar. - Huge improvements in search speed, especially in global (all files) search. Should be at least ten times faster. - Fixed a bug with displaying links a second time! - Global search is functioning, although still slow. It's a modeless dialog. - Fixed mistake in getting help file title. occurrence of each matching word! - Search the topic titles and the index as well. - Double clicking a note in the notes list goes to it. - Search and index search edit boxes are not cleared on close file. - First draft of global search. It's pretty slow. Incomplete. and (of course) display all the results. This could be another option, I guess, but I think mine is more helpful. - Fixed many, many large memory leaks in help file loading. - Load notes before displaying first topic. - Option to use std OS/2 dialog, so that enhancers can replace. - Default filter to only help files. with one or more empty topics. - Fixed extra random data at end of topics. - Fixed crash following link in some cases. - Fixed the display of < and >.